Target blemishes on contact with Ageless Solutions Rapid Blemish Eraser. Ever wish you could wave a wand and make that pimple disappear? Dry up your blemishes and clear infected pores overnight! By blending maximum-strength salicylic acid, sulfur and Zinc-oxide, this formula kills bacteria and absorbs excess oils. Dermatologists have relied on this type of research for over 2 decades. 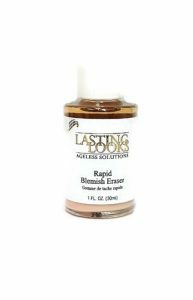 Rapid Blemish Eraser also helps to prevent future breakouts! Now in a convenient application bottle!